Hi there, thanks for visiting. I just wanted to point out that this article was written in April of 2014, the South Bay only had seven craft breweries then. You can find a more current list of breweries at http://craftbeerguy.com/list-all-south-bay-breweries/ (it was written December 2016). I am a firm believer that if one person suggests something, there is a good chance that dozens of others are thinking the same thing. Since I have had many people tell me that I should include maps of the craft brewery tours I write about, I have decided to add a new feature, maps of the various breweries and their relationship to each other. I have decided to use MapQuest since they allow you to plug in your starting point; Google Maps seems to eliminated that feature, so we will use MapQuest until something better comes along. These maps will be set up to show the easiest way to visit each of the breweries visited and will usually form a circular pattern so you are not bouncing around from one end of town to another and back again. I am beginning with the South Bay area of Southern California for a couple reasons. The first, and most logical, is because that is where I live. The second being that there has been such an explosion of microbreweries around here that I know people from other areas would like to know the easiest way to see all that the South Bay offers. Whenever possible, these tours will begin with one freeway close location and end with another freeway close destination. If you are a first time visitor to any of these locations I recommend a purchasing a flight so you can sample what each brewery offers. 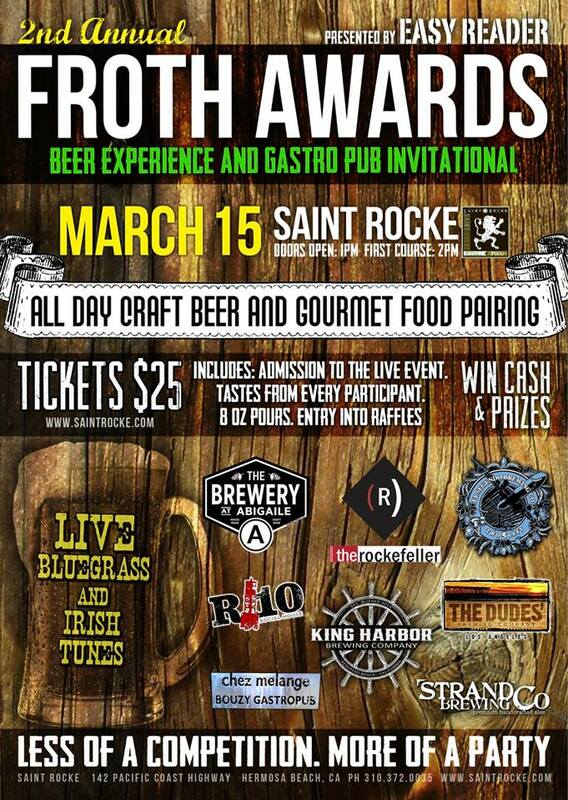 Saturday afternoon, the Saint Rocke concert club in Hermosa Beach held their 2nd Annual Froth Awards: Craft Beer Experience and Gastropub Invitational featuring five of the South Bay’s finest craft breweries paired with dishes provided by four South Bay gastropubs. In addition to the beer and food pairings, there was live music provided by the Aaron White Band, the Get Down Boys and Johnny Jump Up. There were also raffles with prizes such as growlers, hats and other swag donated by the participating breweries and gastropubs and free pizza provided by Fresh Brothers Pizza. They even had a “Best Beard” contest which was won by yours truly. It was a fun day of music, beer and food that consisted of five courses. The first course featured Strand Brewing Company’s White Sand Double IPA with marinated short rib tacos from The Rockefeller gastropub. This was followed by El Segundo Brewing Company’s White Dog IPA paired with tri-tip sliders from California Rancher. The third course featured The Dudes’ Brewing Company and their Kolschtal Eddy which was paired with a Tuscan white braised pork shoulder provided by Bouzy Gastropub. Our fourth pairing was The Brewery at Abigaile’s 002 2nd Anniversary Double IPA with waffles and chicken provided by R10 Social House. The final course introduced everyone to the two newest participants, King Harbor Brewing Company with The Quest (Rakau) Pale Ale and Saint Rocke’s own Kitchen 142. 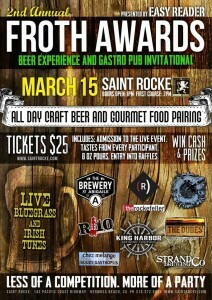 The 2nd Annual Froth Awards will be returning to Saint Rocke in Hermosa Beach, California. Presented by Easy Reader this Beer Experience and Gastropub Invitational will feature craft beers from local breweries El Segundo Brewing Company, Strand Brewing Company, The Brewery at Abigaile, The Dudes’ Brewing Company and the South Bay’s newest production brewery, King Harbor Brewing Company. Food dishes from The Rockefeller, R10 Social House, Chez Melange’s Bouzy Gastropub and Saint Rocke’s own kitchen will be included in the price of admission. Those of you that attended last year’s event will recall that it was originally set up as a competition with each brewery pairing one of their beers with a dish prepared by a local gastropub. This year it will be a little different in that the “competition” has been eliminated and instead it will be a day of craft beers and tasty locally prepared foods. As they put it, this year it will be “less of a competition and more of a party.” I don’t know; last year was a pretty great party. Just like last year, there will be live Bluegrass and Irish music all day as well as various raffles and contests going on. Since we have been on the road lately, I decided that this weekend we would stick around and give a little love to the South Bay’s craft beer brewers for the Valentine’s Day weekend. Friday, Valentine’s Day, we headed over to The Brewery at Abigaile, a brewpub in Hermosa Beach. Since it was Valentine’s Day and we had not made any reservations we took advantage of their Happy Hour seating and grabbed a couple seats at the bar where we were able to enjoy a flight of their brews; including their 002 2nd Anniversary DIPA and Dark Matter a Belgian dark ale that can only get better with age. One of the best things about the release of the 002 DIPA is that it means the anniversary party for Abigaile must be coming soon. On Saturday I headed over to Smog City Brewing where they were hosting a fundraiser for the LA Derby Dolls Enforcers. The Derby Dolls are a Southern California, all-female banked track roller derby league. The Enforcers are the referees for the league. The fundraiser consisted of a raffle for Derby Dolls and Smog City swag as well as beer floats in four different varieties and a pie versus cake sale. Between the people that came out specifically for the fundraiser, the various beer tour buses and those that just wanted to come have a beer, Smog City was packed to the brim. After sampling a couple beers and Tanya’s Death by Chocolate (The Nothing with chocolate ice cream beer float) we headed over to Monkish Brewing. The South Bay’s favorite business networking group, Business & Beer, began 2014 with a great turnout at The Brewery at Abigaile, the beach cities sole brewpub; located in Hermosa Beach. The Business & Beer networking group has been meeting for about 18 months at the various craft breweries, brewpubs and gastropubs in the South Bay. For the first year they met weekly, but in July 2013 it was decided to change the format to once a month; the second Thursday of the month. To do this, gastropubs were dropped from the rotation with the decision being to meet where the beer is brewed. Prior to the change, the attendance levels had started to drop off; it seems that since Business & Beer went to meeting once a month the attendance levels have increased each month. These photos are from the January 2014 gathering of Business & Beer which was held January 9 and I would venture to say that last night’s gathering was double the attendance that we have seen at prior Abigaile gatherings. There was a nice mix of long time attendees with a few people that have only attended a few times and we had several first time visitors. It looks like 2014 is going to be a great year for business and beer. Just a quick note to say Happy Thanksgiving to each of you and your families. Today, Tanya and I will head over to my dad’s for dinner with my daughter and a bunch of siblings. There should be about 15 people there. Since Tanya has been experimenting a lot with her baking, she got put on dessert detail which resulted in three pumpkin pies made from scratch; she even used fresh pumpkin instead of that canned stuff. She also made up some vanilla whipped yams, so the food should be delicious. Naturally, I was assigned beer duty, so Wednesday I traveled around to a few of my favorite places. I started at Beachwood BBQ & Brewing where I picked up a growler of Annihilator, a 12% American Barleywine. I then moved along to Monkish Brewing where I brought home a growler of Magnificat, a 10.1% Belgian Strong Dark Ale, spiced for Christmas. My next stop was El Segundo Brewing Company because no meal is complete without an IPA. I walked out with a growler of Two 5 Left, an 8.2% Double IPA. For dessert we headed to The Brewery at Abigaile where I picked up a growler of Coconut Imperial Red; a 9.4% Imperial Red Ale. I think everyone should be able to find something they will like. If you did not know that October 4 is National Taco Day, do not feel like the Lone Ranger; it seems that this is a rather well-kept secret. The fact of the matter is I did not know it was National Taco Day until almost noon when I saw it float by on my Facebook feed. I decided that since it seems every gastropub and sports bar in Los Angeles County has a Taco Tuesday, I would see what they had to offer for National Taco Day. I put out the question, “where can I get good tacos and craft beer” on Facebook and was given several suggestions. The problem was that a majority of the suggested locations did not see the value of having a website that provided a menu of their food or available beers. Since I was not about to drive 25-40 miles each way on a maybe, I decided that I would stay local. One of the suggestions I got was Hot’s Kitchen, a gastropub in Hermosa Beach. Hot’s has a very good tap list with 56 craft brews available on tap at any one time. They have an extensive list of tacos but had no idea it was National Taco Day; we did not let that stop us. The initial intent of this journey was to visit three locations and split a couple tacos at each location. After splitting a Thai and Lamb Taco between the two of us at Hot’s Kitchen, we both had serious reservations about whether or not we could eat two tacos at the remaining locations. The tacos and beer (Anchor California Lager and Duvel) were great; they had a fly issue that took away from the experience. One of the problems of the beach I guess. Over the past year or so I have been invited to attend several beer events that involved pairing various foods with different beers. Sometimes it seems like there was not a lot of thought put into the combinations and then there are pairings like the LA Beer Week (LABW5) Beer Tasting Dinner put on by The Brewery at Abigaile brewpub on Wednesday evening. It really shows what can happen when you have a chef like Tin Vuong who not only prepares unique menus with global flavors; but also enjoys craft beers. I will admit that there have been times that I have opted for an entree that conflicted with my choice of beer; primarily due to a sauce or seasoning that was so hot that I might as well be drinking Bud Light because my taste buds had lost all sensitivity; last night’s dinner eliminated all risks as Chef Tin’s menu melded perfectly with the beers provided by The Brewery at Abigaile’s Brian Brewer. Our menu included Wit Cured Wild Salmon paired with Tangerine Honey Wit, a Belgian-style witbier; Mary’s Chicken Milanese paired with Sir Charles Mild, an English-style brown mild; an amazing Duck Confit paired with Sticky Fingers IPA; Braised Oxtail with Flat Iron paired with their Nihilist DIPA; with Perfection in a Glass beer float for dessert. It was made with Sarsaparilla and their Black Mass Porter. Brian also brought out some of his Black Mass Porter that has been aging in rye whiskey barrels for the past four months and it is delicious. If you enjoy beer and food tastings, I recommend following The Brewery at Abigaile’s Facebook page so you can be kept in the loop. They do these on a pretty regular basis and I know there are more planned for the near future. When you have an executive chef like Tin Vuong combining his skills with a brewer like Brian Brewer only good things can happen and you do want to be a part of it. Trust me on that one. A few days ago I was at the LA Beer Bloggers Summit and one of the panelist made a comment about how some beer blogs come across as “cheerleaders” and they never have anything negative to say about anyone. I thought about it and in retrospect, thought I did a pretty good job about spreading the love and not really showing favoritism beyond favoring IPAs. As far as negative reviews are concerned, I do not have time for them; it is that simple. That being said, it is really tough to not be a cheerleader when it comes to The Brewery at Abigaile, located at Abigaile in Hermosa Beach. It is hard for me to believe that I have only known about The Brewery at Abigaile for a mere 16 months. I remember with specificity the first time I learned of them and my first visit there. The Brewery at Abigaile is the only brewery in Hermosa Beach and they set the bar when it comes to brewpubs. In addition to the five beers that will be brewed in-house, they have a very interesting food menu and a great guest tap list as well as offering a variety of wines and a full cocktail bar. In my opinion, it is one of the South Bay’s best kept craft beer secrets. If you have the opportunity to visit Hermosa Beach, I highly encourage you to visit The Brewery at Abigaile. LA Beer Week 5 Begins! Today was day one of the of the 5th Annual LA Beer Week (LABW5) which runs from September 19 through the 29th, which is a little longer than a week, but the LA craft beer scene has some catching up to do, so a couple extra days here and there cannot hurt. LABW was founded in 2009 by beer enthusiasts from the LA and Orange County beer communities to help promote this wonderful time that we are living. Indeed, when it comes to craft beer, there is no better time to be an LA area resident. Since it was day one of LA Beer Week 5 (LABW5), I wanted to start the week off with something special. I read on Facebook that Mediterraneo in Hermosa Beach had gotten a keg of Dogfish Head 120 Minute IPA, so I decided I would start off big; with a really big beer. I guess an 18% beer would qualify. A little later I headed over to Naja’s Place in Redondo Beach for their LA Beer Week Kickoff Locals Night. While I have been to Naja’s Place when it was more crowded, I am not sure I have been there when more of the South Bay’s “who’s who” of the beer world was gathered. I have to admit, I was wondering who was tending the farm as it seemed everyone that was anyone in the South Bay craft beer world was at Naja’s. Everyone was having a great time.